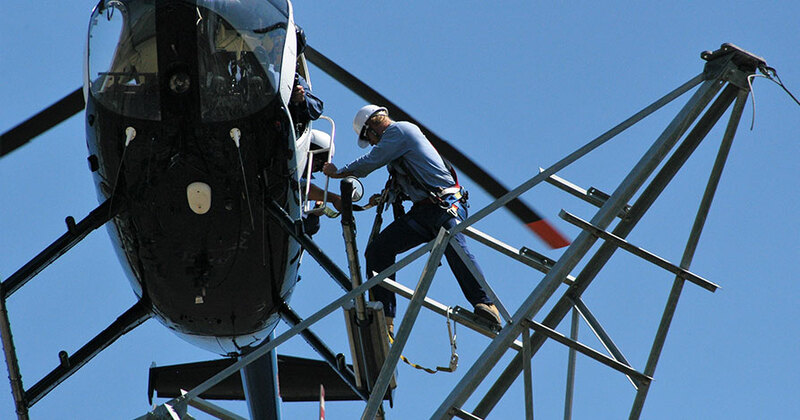 Aeropower’s helicopter transfer procedure allows lineworkers to be transferred from the helicopter directly to the top of a tower structure in a quick, easy and safe manner. 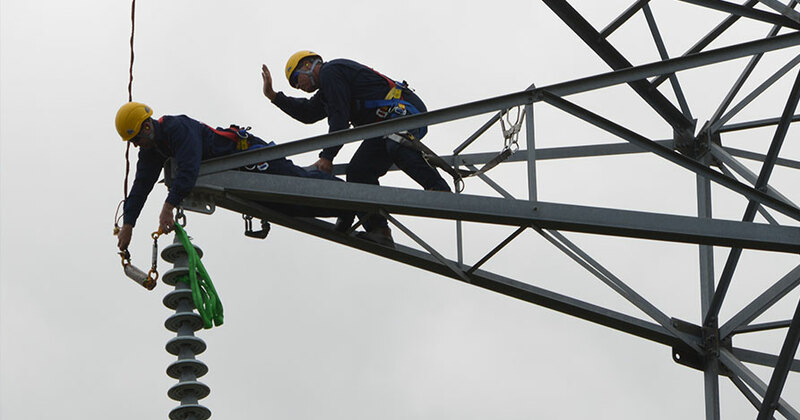 This procedure provides a more efficient alternative to traditional tower climbing methods, with the benefits of higher levels of productivity, less fatigue and quicker access to the worksite. At the same time this procedure can help reduce landowner, property and environmental impact issues by negating the need for earthworks or driving heavy machinery onto private property. 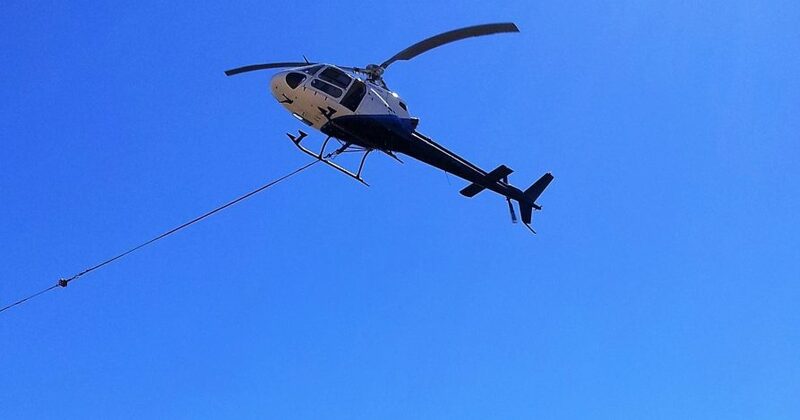 When combined with long lining techniques, a single helicopter can support multiple lineworker teams, on multiple structures, ferrying personnel, tools, equipment and materials. Aeropower’s tower transfer operations are conducted in accordance with industry guidelines and standards, customer requirements and Civil Aviation Regulations. Aeropower maintains detailed work instructions for tower transfer operations within its ISO AS/NZS 9001:2015 Quality Management system. 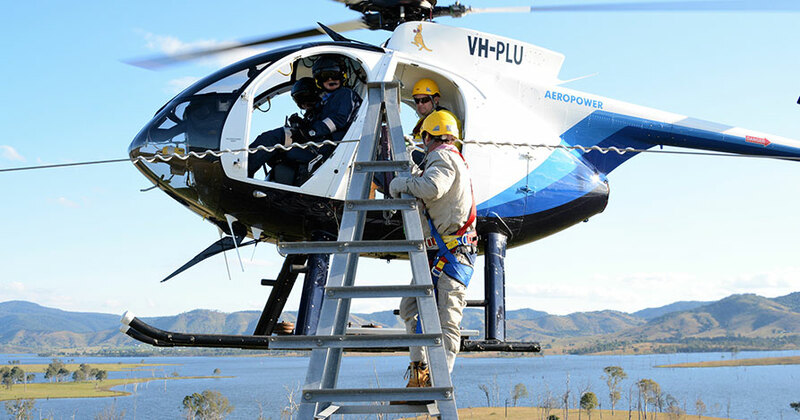 Helicopters can provide an efficient and cost-effective means to ‘string’ powerline conductors, earth-wires or OPGW. 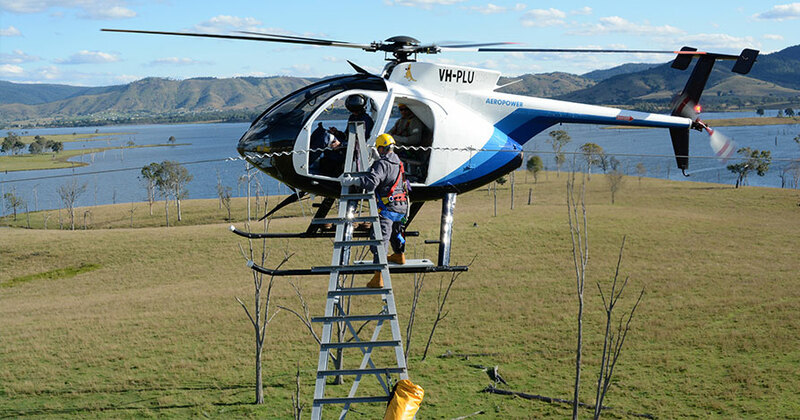 Whether for new construction projects, replacing old or damaged conductors/earth-wires, installing OPGW or repairing fallen lines in an emergency situation, helicopters can save network operators time and money. Aeropower’s cable stringing operations are conducted in accordance with industry guidelines and standards, customer requirements and Civil Aviation Regulations. Aeropower maintains detailed work instructions for all aspects of cable stringing operations within its ISO AS/NZS 9001:2015 Quality Management system. Helicopter based construction operations typically support increased productivity over traditional ground-based systems. Helicopters can improve efficiency and productivity on line construction tasks, while at the same time potentially reducing landowner, property and environmental impact issues by minimising or negating the need for earthworks or driving heavy machinery onto private property. Aeropower’s aircraft fleet supports a range of loads from 500 kg for an MD500 and up to 900 kg for an AS350 Squirrel. For heavier lifting tasks Aeropower can arrange access to medium and heavy lift helicopters. Aeropower’s long lining operations are conducted in accordance with industry guidelines and standards, customer requirements and Civil Aviation Regulations. Aeropower maintains detailed work instructions for long lining operations within its ISO AS/NZS 9001:2015 Quality Management system. Aeropower can provide a range of LiDAR services, with LiDAR equipment and cameras approved for mounting on its MD500 helicopter fleet. These services range from full engineering surveys of infrastructure through to vegetation assessments. Aeropower has chosen to partner with industry leaders to provide LiDAR solutions for its customers. This enables Aeropower to ensure that it has access to the latest equipment and methodologies in an environment where there continues to be rapid technology change and development. Aeropower’s extensive experience in the ‘wire’ environment and flying low level operations, combined with its helicopter fleet, makes it a safe and reliable partner for LiDAR services. Aeropower’s LiDAR capture operations are conducted in accordance with industry guidelines and standards, customer requirements and Civil Aviation Regulations. Aeropower maintains detailed work instructions for all aspects of LiDAR capture operations within its ISO AS/NZS 9001:2015 Quality Management system.